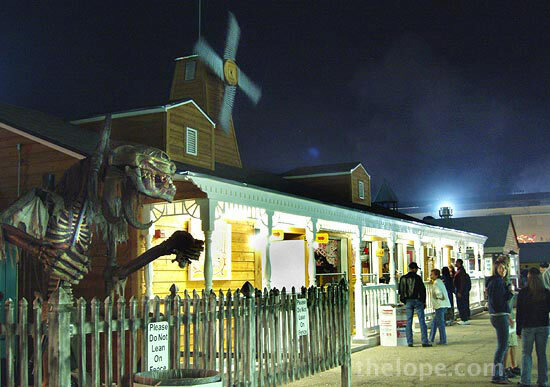 As we reported a few days ago, Ye Old Mill, the 1915 "water dark ride" of the Kansas State Fair, has had a face lift for 2006. The siding and porch are new, and I'd heard that there was "all new stuff" inside. Anytime I hear words like "new", "updated", etc., when applied to a classic building, I shiver. The big Balrog or Malabolgia-like automated thing is still outside; that's a good sign. If you wanna have some fun, watch for people who've just casually stopped by it when it's not active. Then wait. I saw three girls scream and leap a good two feet away when it began to move and speak. 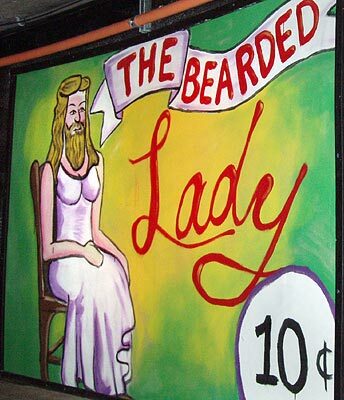 Now that's priceless fair entertainment. 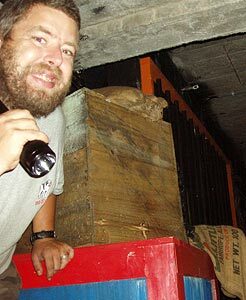 I'm happy to report, however, that Ye Old Mill is just fine inside, having lost none of it's antique machinery or it's dank, dark charm. 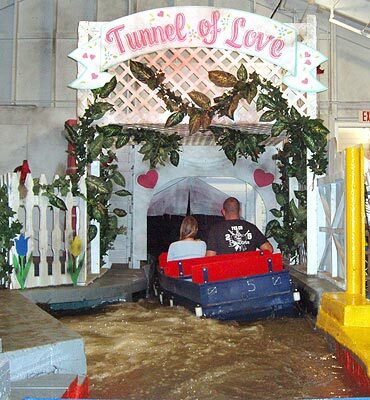 This year, the theme is "Tunnel of Love." At first I was discouraged. What if they softened the place? 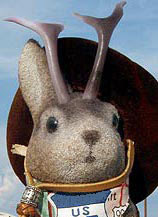 What if it was warm and fuzzy? What is they played pop love songs inside? 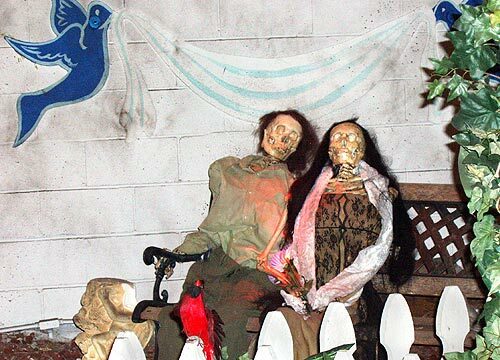 A skeletal couple near the entrance gave me hope. 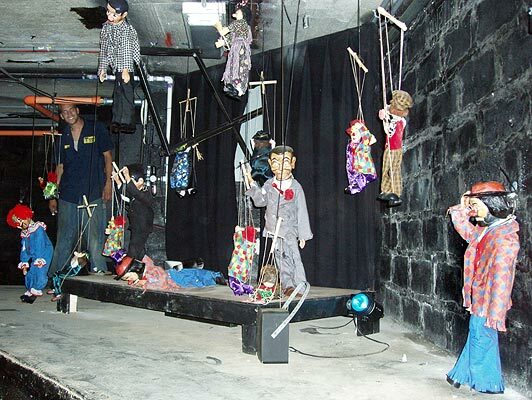 Be not disheartened, oh fans of creepiness; demented clowns dwell within. 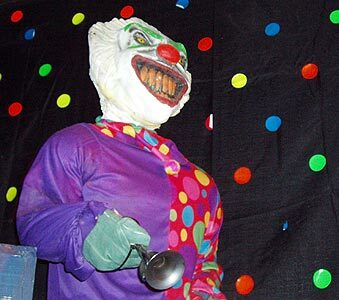 And any sane person knows there is nothing more unsettling than a clown. There's some nice atmospheric artistry inside, too. The audio has also been torqued up this year. In addition to the usual automated pieces, there's still that good old-fashioned human element. 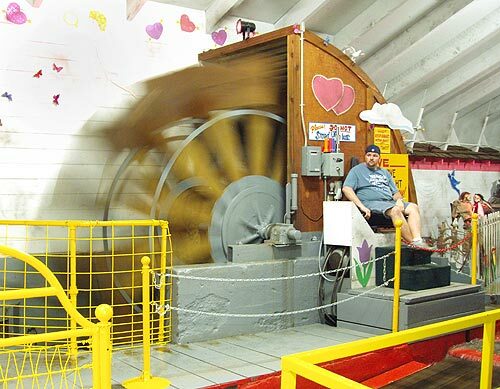 If you value the preservation of Ye Old Mill, you might want to thank Kansas State Representative Jan Pauls of Hutchinson, who hindered a plan by the Kansas State Fair board that would have required tearing down the mill. Remember, without creepy old mills, some people would have no place to live. Actually, these two are living in the Pride of Kansas Building at the moment. If I were them, I wouldn't go back to the mill either. Old movies document well that old mills just aren't safe for monsters or their brides. Remember the part in James Whale's "Frankenstein" when the old mill is burning with the monster inside? ...and the part in "Bride of Frankenstein" in which they find him? Also, it's an agricultural fair and they probably sell pitchforks somewhere. Mobs of villagers love pitchforks. 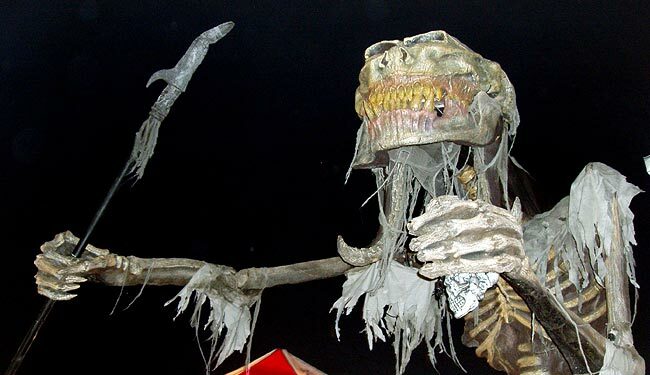 Yeah, best to hang out in the Pride of Kansas Building disguised as scarecrows till the townsfolk leave. 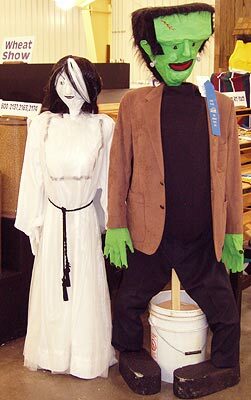 The Frankenstein monster and his bride aren't the only ones hiding out in the Pride of Kansas Building. 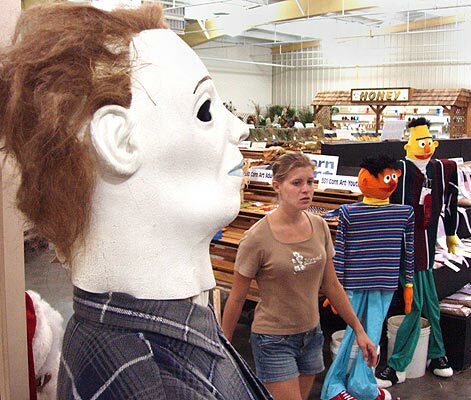 Watch out, lady; Bert and Ernie will not save you from Michael Myers; your only help from Seseme Street might be "the Count". 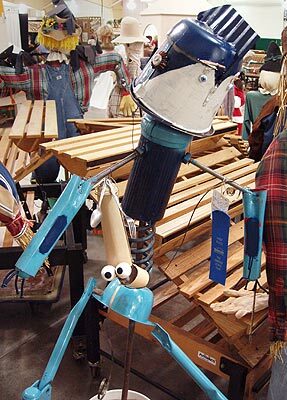 There's also a nice retro-robot scarecrow, based on the movie "Robots." 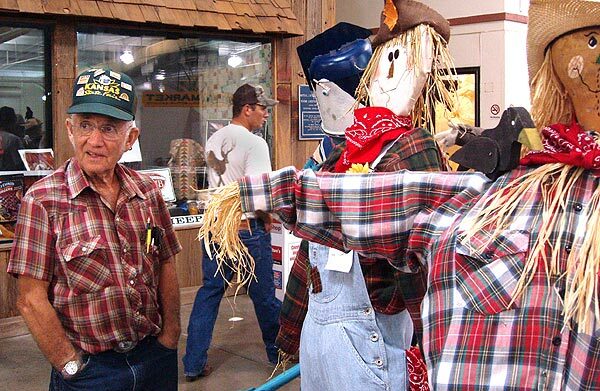 People also admire the more conventional scarecrow-types. Hmmm...isn't there a giant commercial oven being exhibited a few buildings away? And doesn't one of the bulk food places have chocolate chips? 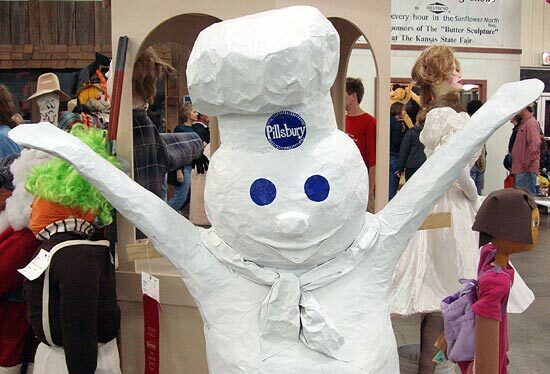 "Hey, Pillsbury doughboy...lets take a walk."